Don’t lose a single hand of freshness and hygiene with the . 66 Oz. Don’t lose a single hand of freshness and hygiene with the .66 Oz. 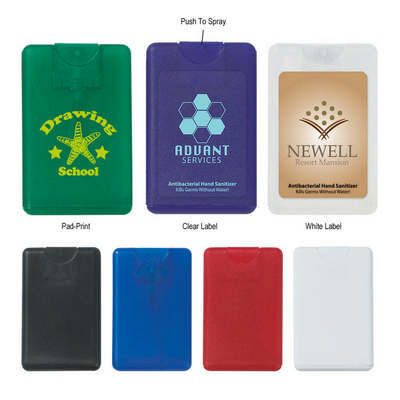 Card Shape Hand Sanitizer by your side. It is effective at eliminating over 99.9% of the germs and bacteria. The chemical formula of this sanitizer meets FDA requirements. It is lightly scented and has a push top to spray. Imprint your company’s logo and tagline on these compact bottles and give them away at hospitals, drug stores, and doctor's offices, to enhance your brand’s value and image.